This airborne autonomous drone is capable of mapping terrain, detecting mines, and detonating them accurately and efficiently. It's also 200x cheaper than traditional methods. Landmines kill between 15,000 and 20,000 people every year. They’re a common enough threat that Bosnian authorities had to make an official advisory warning Pokemon Go players not to veer into areas that might contain landmines. According to the United Nations, the explosive devices are scattered across about 78 countries and most often the victims are children and the elderly. 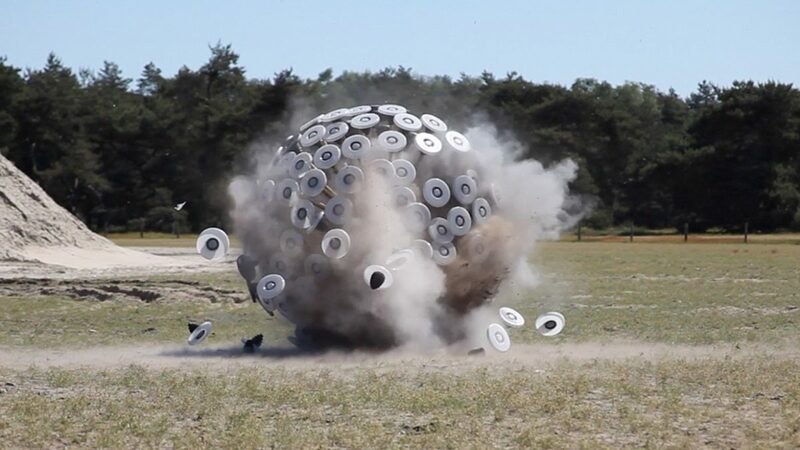 Kabul-born Massoud Hassani set out to address the problem with a low-cost wind-powered mine detonator that went live on Kickstarter in 2013. The detonator rolled around like a tumbleweed and was heavy enough to detonate mines on the ground. At the successful completion of the campaign, the Mine Kafon Foundation was set up. An R&D lab was established in the Netherlands to further enhance the technology. Three years later Mine Kafon is back on Kickstarter, this time with an eye to the skies and a bigger vision. 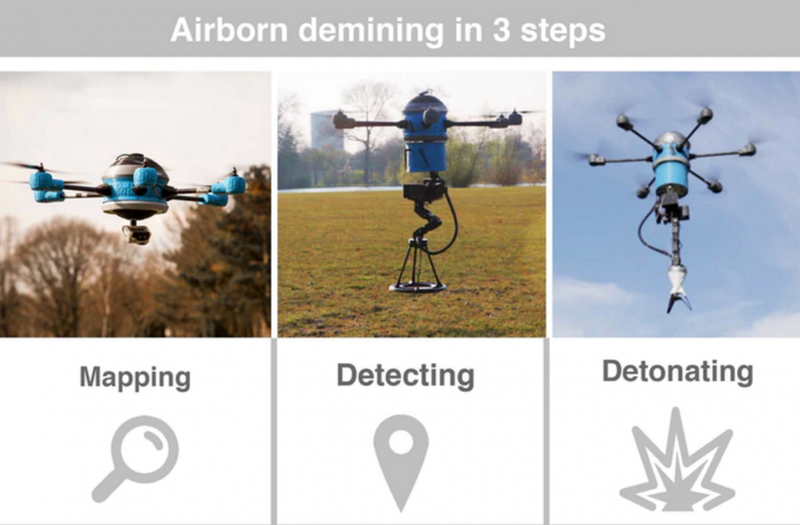 The Mine Kafon Drone (MKD) is an airborne autonomous drone that’s capable of mapping terrain, detecting mines, and detonating them accurately and efficiently. The device manages to carry out the process at a much lower cost than traditional means and is about 20 times faster. In addition to that, it connects to an online platform where a stream of live data is collected and analyzed for future use. The first is to map the region it has been assigned to clear. To do that, the MKD flies back and forth over the area defined in the mission planner using an attached camera to study the landscape. The camera charts out a 3-dimensional aerial map of the location once the entire region has been covered. In the second step, the drone flies over the minefield with a metal detector attached to it, dangling about 4 centimeters above the ground. Every time the detector discerns the presence of a mine, the spot is automatically geotagged on the previously-rendered map. Once the drone knows where all the landmines are, all that remains to be done is to detonate them. A robotic arm attached to the underbelly of the MKD places a detonator over each geotagged spot. The detonators are timed so that the drone is able to get to a safe distance before the mine is detonated. Most countries plagued by the rampant use of landmines currently turn to animals or humans in armored vehicles to detect and detonate mines. According to the Mine Kafon team, their drone is 200 times cheaper and considerably safer than these traditional alternatives. Additionally, the modular system’s features can be augmented by adding tools and sensors as required. Mine Kafon has crossed its Kickstarter campaign goal of €70,000, raising more than €99,000 with almost a full month to go. Funding perks range from a personalized message all the way to one of Mine Kafon’s other drone technologies like the DIY, Air, and Machina. Most importantly, all of the funds will be used to support deployment of the demining drones across some of the most negatively affected countries in the world. Innovation. This is real smart. I like the video and with all of the information on the Kickstarter page, there is little reason to believe any campaign this guy starts would not get funded. This seems like a very ambitious project to detect mines. There is a good reason for this to be used and could save lives of those in the military so I wish the foundation good luck! I am really happy to see this campaign get funded. Good for these guys! Finally, there is something that a drone can do that is well worth the time and effort into flying one.